This evening I was doing the City of the Dead Underground City tour at 9pm, but I was on the Royal mile from about 6.30 to see the street performers and generally hang out. At about 7pm, the cast of "Chomp! 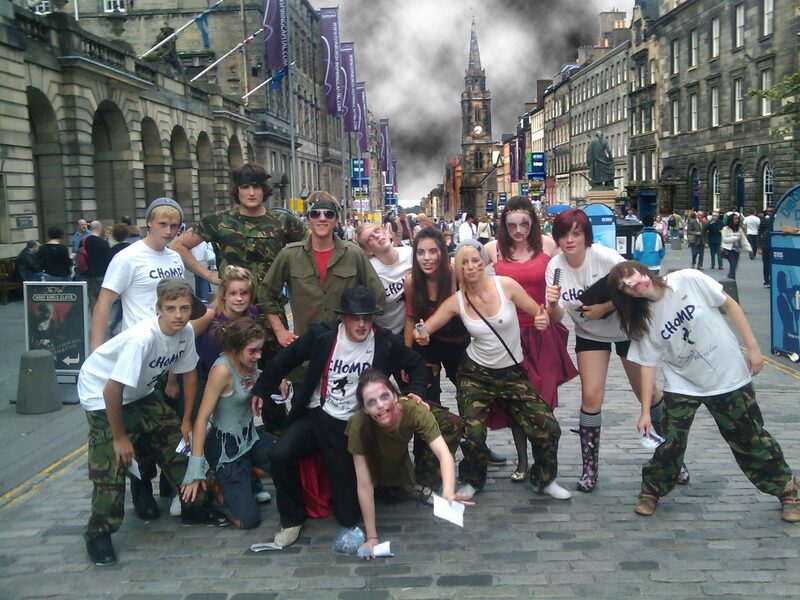 The new Zombie Musical" took over the High Street. Usually at festival time you get hundreds of posh schoolkid luvvies who are in productions and make a fool of themselves on The Mile trying to get people interested in seeing their shows. Chomp! seems a little different - these actors are really getting into the part - a gang of zombies came sprinting up the Royal Mile, chasing each other and terrorising members of the public. Luckily the army arrived and a huge fight broke out between them and the zombies. There was some extremely realistic looking punches being delivered between a zombie in a bowler hat and tails (who I assume is the leader) and one of the soldiers. Then suddenly two of the Zombies broke into song... "Shooting Out The Brains of the Dead" - A jolly ditty about DIY zombie lobotomy - brilliant! The show is on in C-1, Venue 34. 5:15pm 7-8 August. I'm working both nights so I can't make it - you should go though!